Keyboard Dimension : 377.5 x 138 x 33 mm. Key Switch Types : Cherry MX Blue/Red/Brown. Key Rollover : N-Key. Polling Rate : 1000 Hz / 1ms. Keycaps : ABS, Grip Coated. Interface : USB 2.0. You´re a gamer. You know that a mechanical keyboard means the difference between winning and losing. 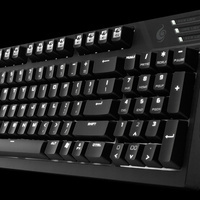 The original QuickFire Rapid gaming keyboard was embraced by gamers worldwide because it made the difference. Now the QuickFire TK takes the QuickFire Rapid and put it on steroids! Choose between 3 different Cherry MX switches. Each keycap is UV coated to make it durable. There´s full LED backlighting with 3 modes and 5 brightness levels. NKRO over USB means every single keystroke will be registered. An embedded steel plate give you maximum stability and durability. 7 easy-access multimedia shortcut keys save time. A complete numpad lets you get work done while not gaming. The slim and lightweight size gives you plenty of room for your mouse. Great for LAN parties. Detachable braided USB cable and cable routing groves at the underside of the keyboard. Easy cable management and better flexibility. Full LED backlight, 3 modes and 5 brightness levels. Stylish and provides optimum visibility even in dark rooms. Different backlight modes highlight different key groups. Compact layout with integrated Num pad block. The QuickFire TK’s unique NumPad block design merges both navigation and command keys. You get a compact gaming keyboard with a NumPad block.